Monitoring and characterizing the growth and morphology of nanoparticles in complex environments is an experimental challenge which needs to follow changes at the atomic scale, as well as a theoretical challenge, which needs to represent objects realistically. - In situ and real time growth by X-ray scattering and optical measurements. 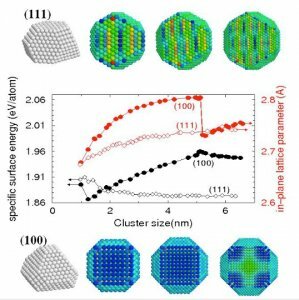 The originality of the experimental group is to study the growth of epitaxial metal clusters on oxides in situ and in real time by grazing-incidence small-angles X-ray scattering (GISAXS) at synchrotron facilities or through the particle plasmon response. We can say metaphorically that we « see » nano-particles grow. The objectives are : (1) the characterization of the morphology of supported particles (size, shape and density) by the definition of an « average » particle, (2) the determination of the power laws that regulate growth and coalescence ; (3) the characterization of the wetting and adhesion via the Wulff construction or determination of the contact angle. 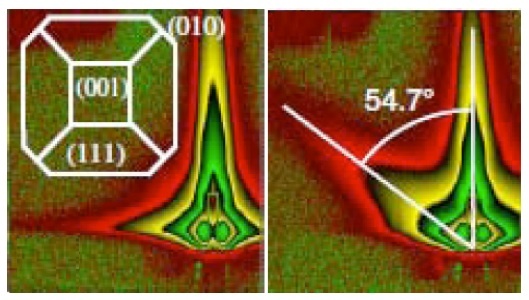 Experimental and simulated GISAXS patterns for 6 monolayers of Au deposited on TiO2(110). R. Lazzari, G. Renaud, J. Jupille et F. Leroy, Phys. Rev. B. 76 (2007) 125412 [link]. Growth of silver on alpha-Al2O3(0001) analyzed by surface differential reflective spectroscopy (SDRS) - The silver clusters are represented by truncated spheres. 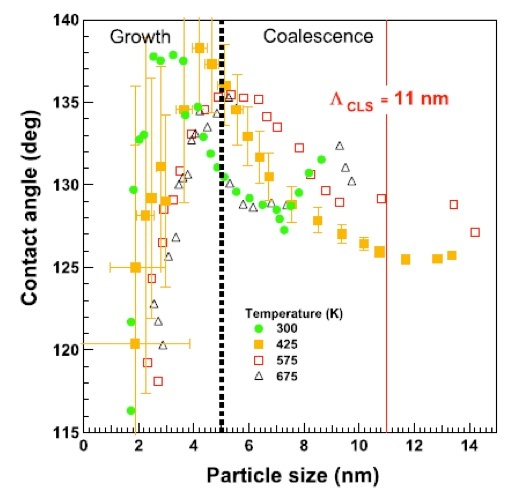 The contact angles determined by modelling SDR spectra vary with particle size, with dominant trends that correspond to phases of growth and coalescence. The vertical line corresponds to the point where the first dislocation is expected. R. Lazzari et J. Jupille, Nanotechnology 22 (2011) 445703 ; Nanotechnology 23 (2012) 135707 [link]. - Equilibrium shape, growth and epitaxy of metallic aggregates. GISAXS patterns recorded during the growth of Ag/MgO(100) with the incident beam in the  (left) and [1-10] (right) directions – The intensities are represented in simulated colours – Obtained from GISAXS analysis, the top view of the particle with a cubo-octahedral shape is represented on the left. C. Revenant, G. Renaud, R. Lazzari et J. Jupille, Phys. Rev. B 79 (2009) 235424 [link]. 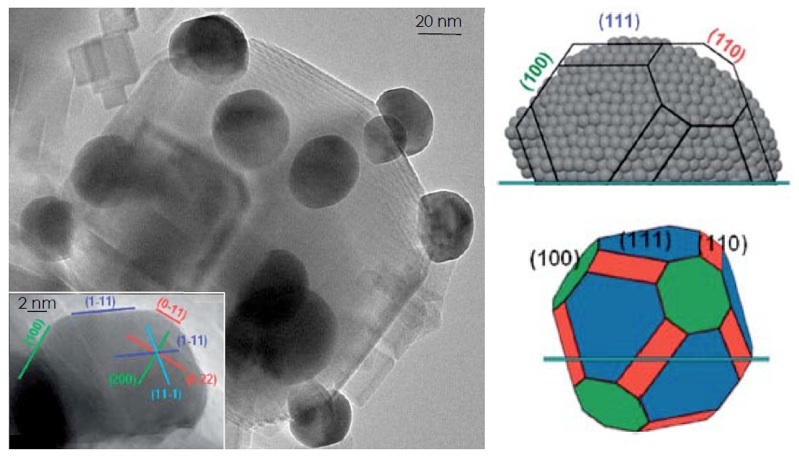 The profile of the cubo-octahedral shape obtained from the above GISAXS pattern is directly observed by high resolution transmission electron microscope (HRTEM) for silver nanoparticles supported on MgO smoke crystallites (left) - silver aggregate view along the  axis (left insert), with (111), (110) et (100) facets is compared to a simulated aggregate and the associated Wulff construction (right). The highlight of the (110) facet is a first. 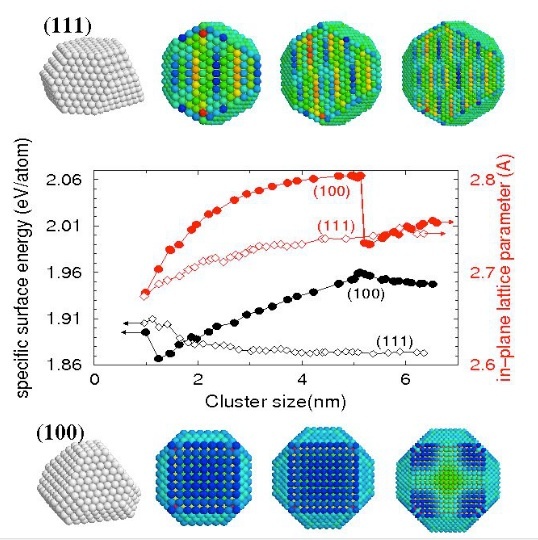 S. Stankic, R. Cortes, J. Goniakowski, D. Demaille et J. Jupille, Nanoscale 5 (2013) 2448 [link]. 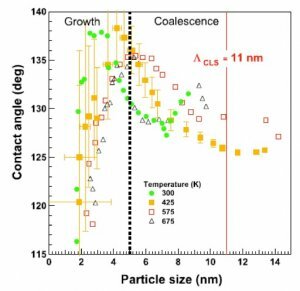 - Nucleation phases, growth and coalescence dynamics are characterized by power laws as a function of time and correlate with fine changes of the form of the aggregates according to the constraints. 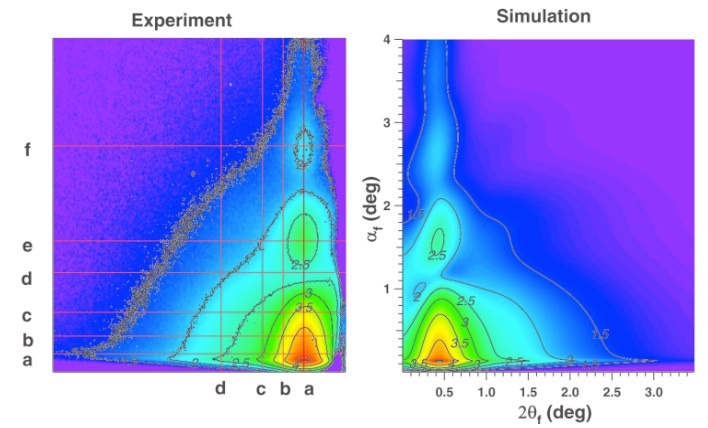 Molecular dynamics simulations of equilibrium forms and growth processes have explained, through an extension of the Wulff-Kaishew theorem to nanoscale objects, the variability in size and temperature of the observed epitaxial relationships. Changes in the size of the energetics and of the Pt-Pt distance at the interface for the two orientations Pt (100) and (111) on MgO(001). The agreement at the interface results in the pressure maps. J. Olander, R. Lazzari, J. Jupille, B. Mangili, J. Goniakowski, et G. Renaud, Phys. Rev. B 76 (2007) 075409 [link]. - Environmental control of interfaces. 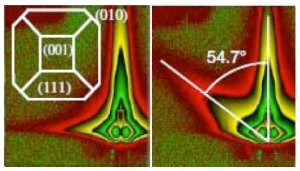 With an approach strategy theory/experiment (optimal interfacial conditions determined by calculations and return via experience), we analyze the adherence of metal/oxide interfaces. The sensitivity of surface terminations of oxides (especially polar) towards the chemical environment induces that the properties of metal/oxide interface strongly depend on thermodynamic conditions. We are working to control these levers of great fundamental interest which are of relatively easily operated in an industrial setting. Two examples illustrate the approach. The interface Zn/alpha-Al2O3(0001) is inspired by the galvanization of steel. In the manufacture of metal sheets, additions (Al, Si, Mn) included in the various steel grades with high elasticity yield by induced segregation to the formation of surface oxides with poor wetting ability by Zn. The contract in partnership with the research centre of ArcelorMittal Maizières-lès-Metz, combines experience and ab-initio numerical simulation. The representative of the actual interface Zn/alpha-Al2O3(0001), poses a significant issue since the termination alpha-Al2O3(0001) is potentially polar or non-polar depending on the redox nature of the environment. This suggests very different wetting properties that can further modify specific additions. Many applications are affected by the transparent conductive layers, including OLEDs (Organic Light Emitting Devices) or LEDs, the future of lighting (20% of the electrical energy today !). However, current solutions (indium tin oxide, ITO) are based on scarce raw materials. In collaboration with Saint-Gobain Recherche (Aubervilliers), we consider the use of Ag/ZnO thin films (similar to low-emissive layers) as transparent conductive layers by exploring the characteristics of interfaces of silver with the polar terminations of ZnO.